‘I have always known that fairies exist because there is a right and a wrong way to draw them,’ writes C Van Sandwyk in the preface to How to see Fairies. It is a bold statement, one that oozes self-assurance. Within a few pages of exploring this remarkable book one can see that such confidence is by no means misplaced. C Van Sandwyk can draw fairies and draw them beautifully. Not only this, his sparse world of make-believe can also mesmerise as effectively as a bop on the head with a tiny pouch of fairy-dust. 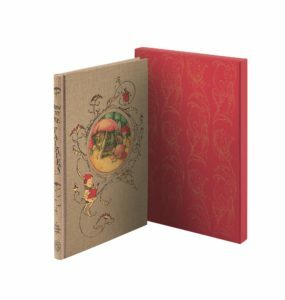 The book consists of a collection of previous works, exquisitely bound together for the first time, with mainly full colour illustrations and some line drawings. The Fairy Market is beguiling prose with a message that happiness is a commodity irrespective of size. How to see Fairies is a whimsical piece of prose that acts as guidance as to how to observe fairies in the world about us. The Gnome King’s Treasure Song proves an insightful view of nature and simple living overseen by the titular character. There is a departure from prose with The Pocket Guide to Little People, were Sandwyk provides us with hints and tips for spotting our fey friends in their natural habitat. Afterglow is another piece of smooth verse that describes a celebratory gathering of the little folk, drinking nectar and enjoying the revelry. Wee Folk is a collection of drawings that chart a journey through the Great Woods, from dusk until dawn. The collection concludes with the delightful Yuletide tale, The Fairies Christmas. It would be easy to allow the incredibly detailed images contained in How to See Fairies define a review. After all, illustrations alone do not always a good project make. It is a relief then to say that the magical pull of the artwork extends to the words, with their calligraphic fonts, and smile-inducing content. There is a deft touch to the prose, whimsical observations abound, and a sense of complete authenticity to the whole reading experience that by the end of the book the instinct is to return back to the beginning. Pricing may make the corner of the eyes twitch on first viewing, but what you are buying with this book is an experience and, yes, a magical work of art. Between the pages comes the kind of comfort that is wholesome and leaves a sense of contentment that is as lingering as it is satisfying. You cannot put a price on pleasure.